Considering these days there are so many ways for malware and viruses to infect your computer – from online activities to USB drives and DVDs –, there’s always the possibility that some of these threats manage to infiltrate your machine, no matter how many security measures you have in place. Applications such as UnHackMe were designed as a last resort solution, for the situations in which your computer is already infected with malware. This software suite will attempt to detect all attempts of unauthorized access which may occur on your machine through the malware type known as rootkits. Launching a scan to detect Trojans is resumed to click on the ‘Check Me Now!” button. A pop-up window will be displayed where you can choose to start a cleanup job, a malware scan, or protect and backup your files. The malware scan can be customize in various ways. For example you can set UnHackMe to check Windows startup items, send a report, launch an online scan using multiple antivirus engines as well as show any hidden or infected files. An interesting feature of the application is called the Reanimator. 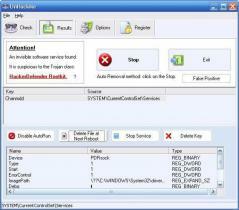 It lets you launch a complete spyware check, altough UnhackMe also lets you create system backups and the integrated Restore Manager allows you to revert Windows to a previous state. What’s more, the tool provides a real-time protection function, a scan scheduler and a customizable whitelist among other useful capabilities.